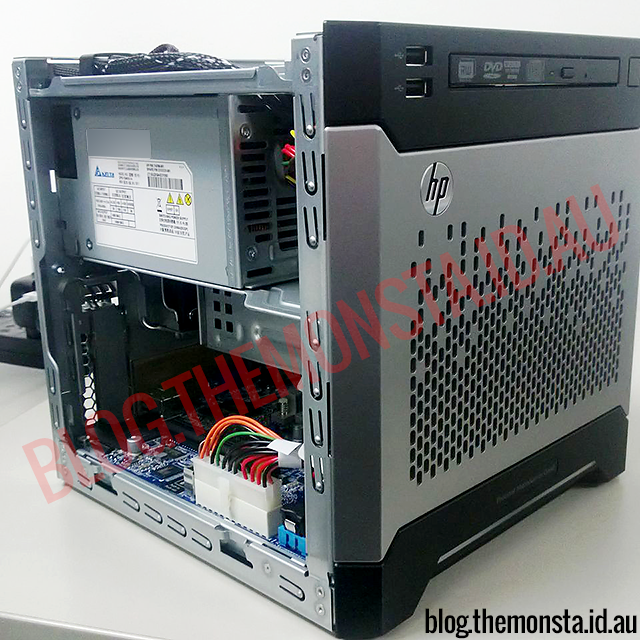 Well here are the photos you have all been waiting for – a world exclusive of the HP Microserver G8 with all the internal photos to answer all the questions you were after, and a full 7 days before the Official HP product announcement. First off, we have inside the door. We see a completely different design in the G8 from the outgoing G7. The biggest changes are the stock HP Non-Hot Plug LFF Drive caddies, some of you may already be familiar with these from the DL120 servers. Also the front of the server is closed with meshed steel panelling. This is quite the change from the open fronted G7 where you could open the door to gain access to not only the hard disks in the cage, but also the internal USB port. Other features of note include a magnetically latched door, and no apparent locking mechanism. To me, this seems like a major oversight from HP as they are positioning this model as an enterprise-ready, remote branch office basic file & print server, maybe doing local Active Directory, DHCP & DNS. As a IT Consultant that specialises in hardware and networking myself, I know how inquisitive fingers can be. If I was putting any sort of server in a remote location, I would want it locked down tight. The key lock of the G7 achieves this, but is conspicuously absent in the G8. And yes, that thing on top we cannot tell you about yet, but there will be a reveal on this blog later this week ahead of the official HP announcement of this server at HP Discover in Las Vegas on 11-13 June. Next we pop the case off and have a look on top. We see a large rubber grommet on the top of the Microserver unit, stamped with ‘FBWC’ – or in HP jargon – Flash backed Write Cache. This is what will turn your standard disinterested RAID10-level B120i controller into a much more efficient and effective RAID5 unit. You can look up the cost of these FBWC modules yourself, but brace yourself for some sticker shock as they are not cheap. Also, we have not yet spotted a header on the motherboard where these plug in. 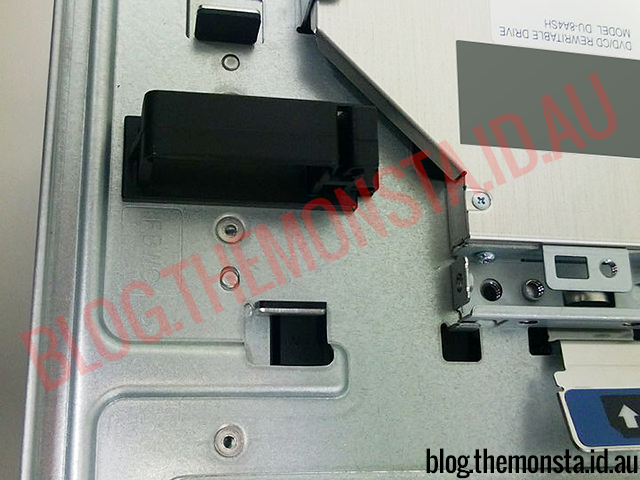 On the right you can also see the quick-release tab for the slimline DVD/RW optical drive. You have seen these on most of the current G8 servers and probably some of the bigger G7’s also. 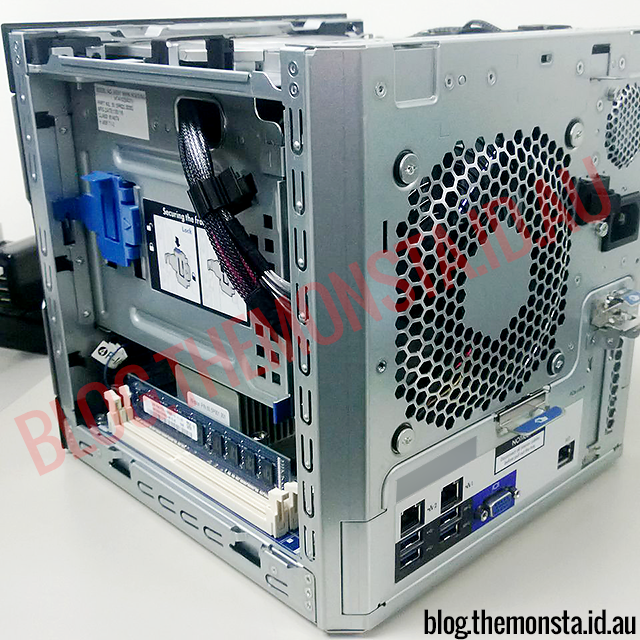 We now move to the rear of the unit, where we can see two Gigabit Ethernet ports, four USB3.0 ports as previously confirmed on this blog, VGA port, dedicated iLO4 port, and a low-profile PCIe x16 slot. There’s also a standard IEC power plug for the PSU, and you will notice the sound-deadening rubber grommets around the main fan screws which help to lower noise. One thing that may slip you attention – the quick release motherboard tray tab just underneath the main fan. Push that tab down, and as long as you have unplugged all cables in the motherboard then you can pull that entire motherboard tray out bacwards without tools. For those of us with skinned knuckles after the G7, this looks extremely easy to work on. We now look at the right hand side, and there are two major points of interest. First and most obvious is the two memory slots which will make memory replacement one of the easiest things you have ever done, definitely easier than upgrading the RAM in a laptop. Bravo HP, you are to be congratulated on this very intelligent design. So what is the second thing I hear you ask? That blue tab halfway up – that’s your new door locking mechanism! Close the door, push down on the blue tab and it will lock the door shut. Still not the best or most secure solution in my eyes, but will keep most inquisitive fingers at bay. Now, the side you all really want to see. A standard 150W power supply could indeed be replaced by a more efficient PicoPSU supply and leave plenty of room for at least a couple more drives, maybe you could squeeze 4 2.5″ drives or SSD’s in there. There are plenty of other goodies in here, but we need to take a closer look. BOOYAH! Click on it to take a closer look! There is plenty going on here, so lets take it one step at a time. First off is the CPU. Now that looks like a reasonably standard Northbridge heatsink, but in this case it actually does the cooling duties for an i3-3220T CPU. This CPU has a TDP of 35W and is pretty much the limit for non-active cooling with a fan. We cannot see if there is a socket under there, but the heatsink seems to be fairly high off the motherboard so initial signs look good for a socket. Moving left, we can see the power MOSFETs for the CPU power have a heatsink on them too. This will be helpful and make the G8 more reliable. Further left again and we can see the HP iLO chip which houses plenty of internal smarts for out-of-band remote management. In my day job, we only use HP servers and iLO is the best remote management solution out there bar none. If you haven’t experienced iLO in an enterprise server yet, then you are in for a big surprise. 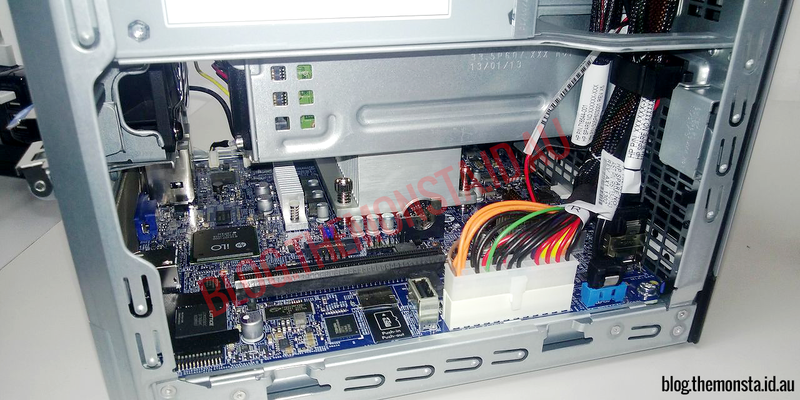 Towards the front we have the single PCIe x16 expansion slot. This is a little disappointing as many of us were using the x1 slot on the G7 for another network card, possibly a TV tuner. Personally I modded the x1 and proprietary x4 slot into open slots, and dropped a HP NC360T dual-port Gigabit Ethernet card into it. that addition gave me a total of 3 network ports which is almost a requirement for an ESXi lab machine. Hopefully I can get a USB3.0 network adapter which is on the VMware Hardware compatibility list soon. Down the very front you can spot a MICRO SD CARD SLOT! SD card slots have been on the motherboards of a number of HP servers for a while now, but I have never seen a Micro SD card slot. This is an amazing addition to the Microservers. Next to it you can see the USB2 port for booting from a USB stick – handy for BIOS flashes, or even booting ESXi or FreeNAS from instead. To the far right we can see a single SATA3 6.0Gbps port, whereas we had documentation leaked from HP stating two SATA3 ports on the motherboard. Now we hope the final units have two ports but I can imagine HP seeing it as a non-essential port. 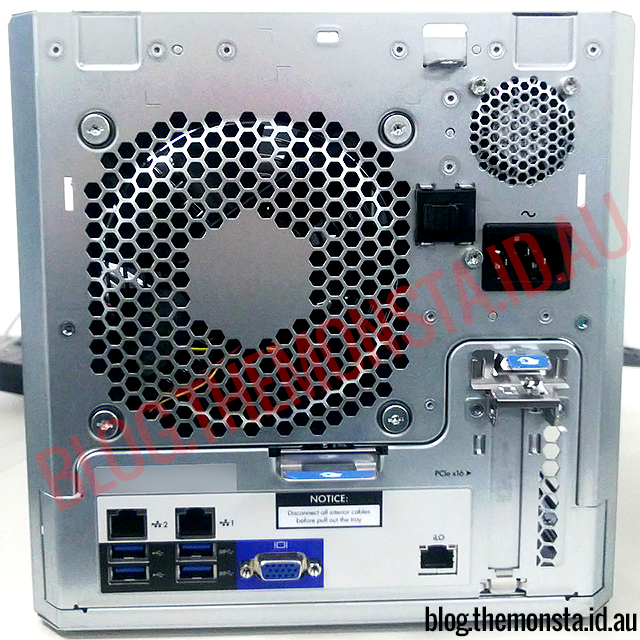 You have got one SATA port for the DVD drive, why do you need two? It seems like HP does not want us to have extra drives. Finally, we can see the SAS connector on the furthermost right, again providing onboard hardware RAID to the drives in the internal LFF cage. Finally, the specs of the beta machine. Please remember that this is a beta unit and specifications usually do change. That said, this unit looks reasonable close to manufacturing ready and I doubt there would be too many changes to the chassis or motherboard. About the only thing to change would be the CPU I would suggest. I hope you have enjoyed our run-through of the beta G8 model, and stay tuned for a special top-secret reveal later this week. I would suggest subscribing to our RSS feed so you get the information as soon as we post it. 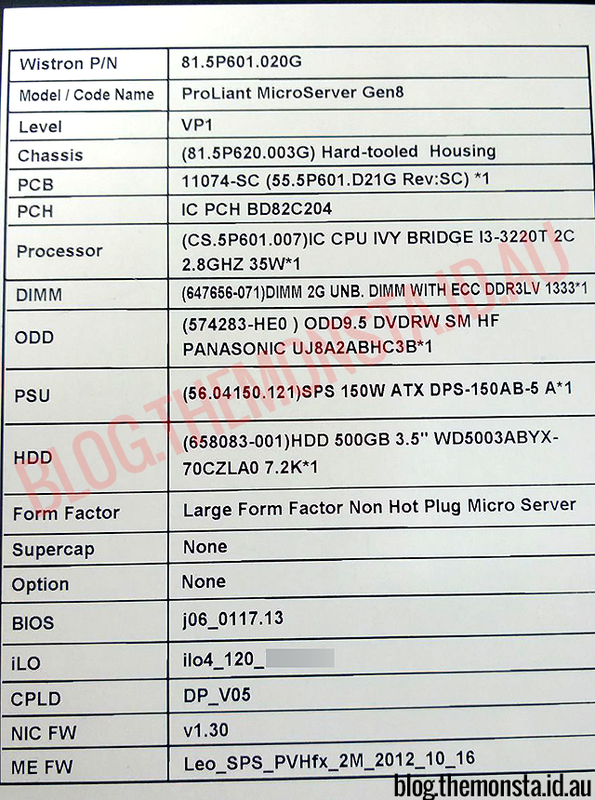 Based on events of the last 36 hours, I have been leaked a few very interesting pieces of information regarding the upcoming HP Microserver G8 which is due for release very soon. It seems that not everyone within HP and their contractors are happy with the way that HP has handled the leak on specifications yesterday. This question has been asked relentlessly in fora all over the intertubes. 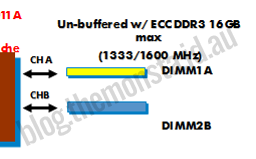 While the G7 range of Microservers officially supported a maximum 8Gb of 1333Mz DDR3 unbuffered ECC RAM, there was certain RAM modules which were compatible ‘enough’ so that 16GB of RAM was detected on boot, and a fantastic database of working modules was maintained on the Microserver Wikia page. While most of the Microserver units seemed to work okay, there were just some that would never see 16GB and would only detect and use 8GB of RAM. For most ESXi users, the difference between having 8GB or 16GB usable was around 4-5 Virtual machines per box on 8GB, or 10-12 virtual machines if you could get 16GB working. In a virtualisation sense, the difference is huge. So in the last 24 hours, we have been lucky enough to receive the Microserver G8 System Diagram from an internal HP source. While there is more to this diagram, we are only publishing a small amount of it in case of traceability and to protect our source. As you can see, there will be two memory channels off the integrated Intel CPU memory controller each running a single DDR3 slot on the motherboard for a total of two RAM slots. The G8 Microserver maintains the G7 support of 1300Mhz DDR3 in either normal desktop SDRAM or unbuffered ECC. The G8 increases the memory speeds to 1600Mhz, and takes official memory capacity to 16GB. This is excellent news, those upgrading will be able to transfer their previous 16GB kits into the new G8 units, on the proviso that they have enough physical clearance between other components in the new model. Those that purchased the 16GB 1333Mhz ECC kits from Kingston or Crucial should see a straight swap with zero issues. Of course, until we get the new units in our hands we cannot test and see if 32GB of memory in the unit would work. That said, remembering that since this is a relatively cheap machine to purchase, the idea of buying 16GB DDR3 ECC DIMMs seems rather expensive as these are most definitely a enterprise server part and commands a premium price. In any case 16GB is supported, which for some will be comforting and a bonus if their G7 never quite got to 16GB. For others it will be a disappointment as it is no real improvement on their G7. Put your comments below!